Almost 26 years after he left office a one-term president, George H.W. 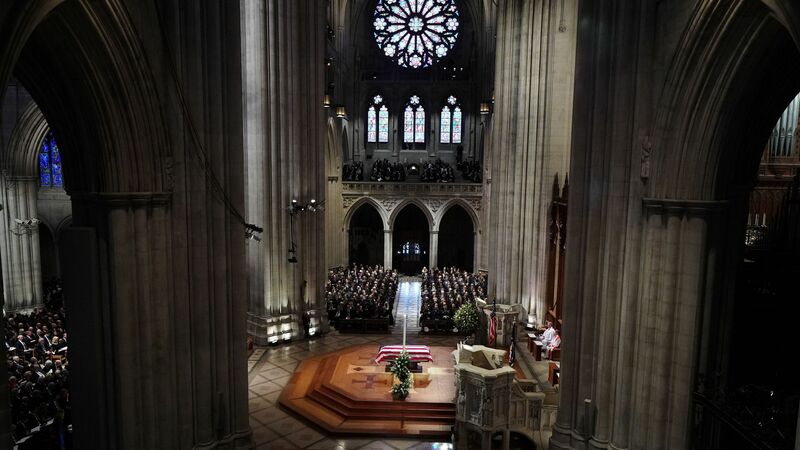 Bush was remembered today as a great man — with the chancellor of reunified Germany and the president of free Poland in the pews. Bush biographer Jon Meacham: “His life code as he said was tell the truth, don’t blame people, be strong, do your best, try hard, forgive, stay the course. And that was and is the most American of creeds." Why it matters: The world that was in many ways born during the Bush administration — as the Soviet Union crumbled, democracy spread and America’s preeminence solidified — is under severe threat, Axios World Editor Dave Lawler emails. Russian aggression is again a chief threat to American and global security, with a different type of rivalry under Vladimir Putin but a rivalry nonetheless. China has supplanted the Soviets as America's great rival: The new wars are over trade and intellectual property, with our unipolar status fading fast. Europe is fraying: The nationalist right has taken office in Poland and Hungary, and has the ground crumbling under German Chancellor Angela Merkel’s feet. Euroskeptics were swept into office in Italy. The U.K. is leaving the EU. The Middle East is a mess: 28 years after Bush declined to march on Baghdad, and 15 years after his son chose the opposite path, the countries of Iraq, Syria, Yemen and Afghanistan are in tatters. The bottom line: Bush was a champion of the U.S.-led world order who valued alliances and building international consensus. In 2018, President Trump's rhetoric is "America First." 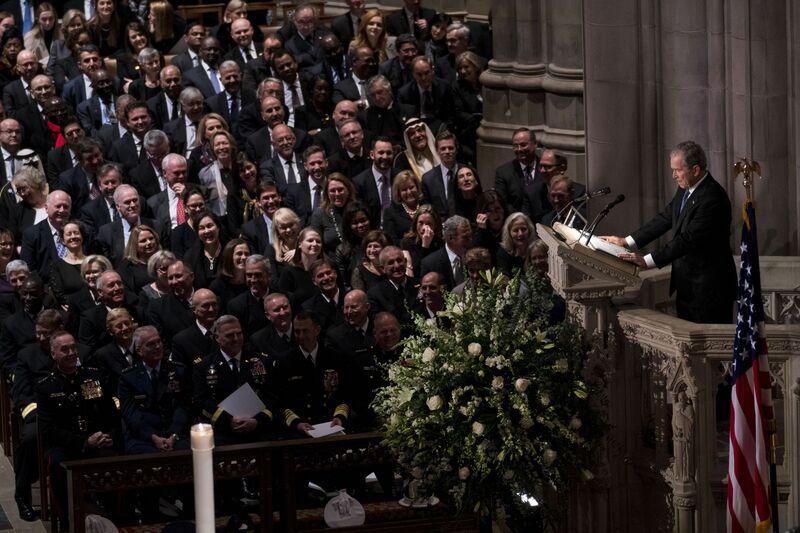 Above: Former President George W. Bush eulogizes his father. 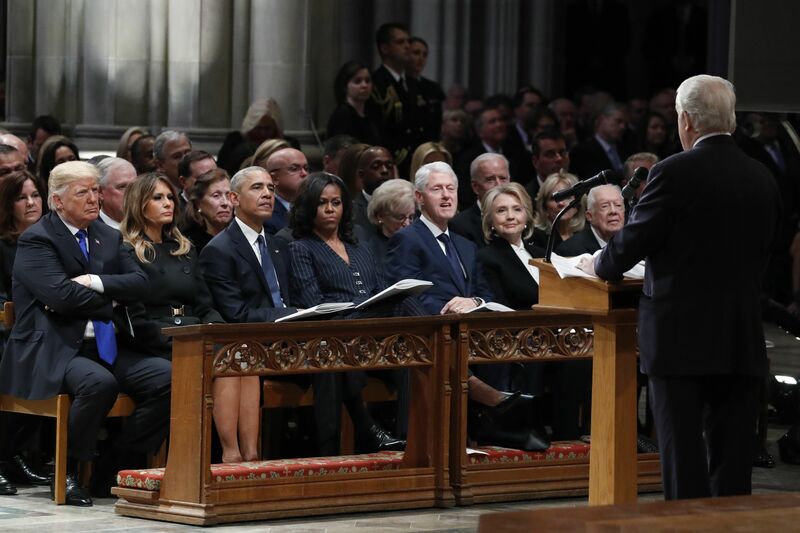 Below: Every living president at today's funeral. The Facebook papers: A British lawmaker released documents today that show the social giant considering aggressive routes to squeeze more revenue out of user data, giving major companies extra access to data and undermining competitors. Go deeper. Highest carbon levels in recorded history: Global carbon dioxide emissions from the burning of fossil fuels are projected to rise by more than 2% in 2018. Go deeper. Wisconsin GOP's unusual step: The state's legislature, during a lame duck session, approved a raft of measures that will strip powers from incoming Democrats. Go deeper. Trump tweets on China and fentanyl: Trump said this morning that China's commitment to curtail fentanyl exports to the U.S. will have "incredible" results, although China has made a similar pledge before and experts say tackling the issue is complicated. Putin's missile threat: If the U.S. exits a Cold War-era missile treaty and begins developing new intermediate-range missiles, his country will follow suit. Go deeper. "How Pink Salt Took Over Millennial Kitchens: It’s not healthier for you. It doesn’t technically come from the Himalayas. But pink salt’s appeal has exploded nonetheless," Amanda Mull writes for The Atlantic. "Specifically, almost all pink salt is branded as Himalayan. Most of that comes from the enormous Khewra Salt Mine, situated between Islamabad and Lahore in Punjab, a bit south of the actual Himalayas in Pakistan." "[I]f you’re interested in food at all, you’ve probably encountered pink Himalayan salt periodically since 2009. That’s when Trader Joe’s started carrying it prepackaged in a grinder..."